There are a few bridges across the world that are frightening. One is so scary that it gives people panic attacks while they are driving across it as it is one of the tallest and most outrageous bridges in the world. The Eshima Ohashi is located in Japan. 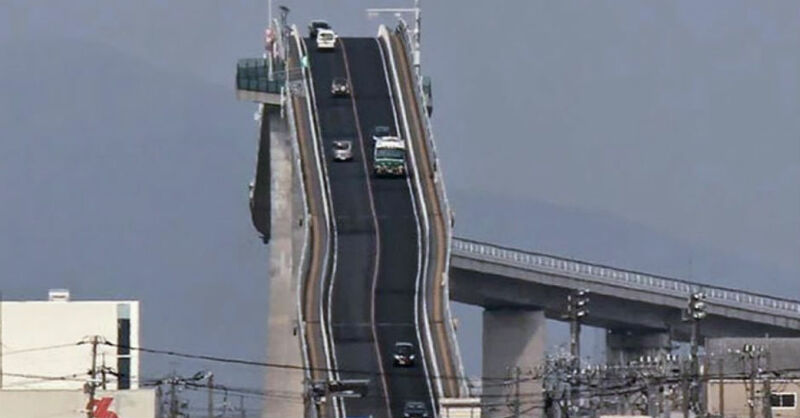 It is a bridge that is paved like many others, but the design is somewhat odd. It almost looks like a roller coaster. There are steep hills to climb and steep drop-offs that would make you think that you're going to drive right into the road below. When you look at the bridge from across the city, it appears as though it's a normal bridge. It crosses a river and has plenty of room for ships to navigate underneath. The bridge is built very high for his very reason. It's also why the bridge has the slanted design at one end as people have to get back to the road somehow. There are about three inclines on one end of the bridge in order to get cars up to the bridge. Going up isn't quite as bad as going down the side of the bridge. The slope is only set at a 6.1, which really isn't that steep, but the overall design is what is terrifying to drivers.